At the V&A we always try to encourage people to unleash their creativity through our galleries and our programming. In the V&A Museum of Childhood’s (MoC) current exhibition, A Pirate’s Life for Me, we wanted to show how pirate stories have sparked children’s imagination for many years. 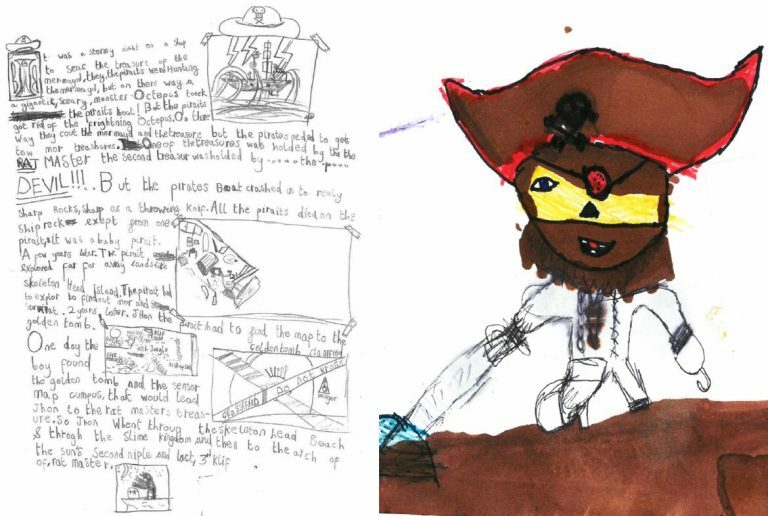 In the exhibition’s first section, ‘The Grim Grog Tavern’, we displayed together a pirate play written by a nine-year-old, two homemade comics containing pirate stories, and a watercolour illustration of a fearsome buccaneer. These objects, dating from the 1920s-1950s, demonstrate how children digested pirate influences from stage, page and screen to create something personal and fantastical. We wondered whether children’s imagination had changed much over the last hundred years, and decided to try and find out. Eventually, we determined that a ferocious five-year-old called Birdie had made the finest pirate creation, Saran Shipwreck. Her typed account of Saran’s quest for a mint choc chip ice cream had us hooked. For the picture, we loved Birdie’s use of colour and different media to make the sails of the ship and Saran’s hat. Her attention to detail really impressed us! Using a rubbing of a pirate coin for the sun really brought a smile to our faces and shows real creativity. Saran Shipwreck is clearly a proper pirate and has great taste in summer snacks! A close runner-up was ten-year-old Malakai’s charismatic Captain Blade Cross. The detail in this pirate’s expressive face shows a high degree of artistic talent. He looks a force to be reckoned with! He has all the hallmarks of a classic pirate, with the added flourish of a dashing polka dot coat. Malakai’s imaginative story tells us that Blade Cross isn’t just restricted to seven seas, he can sail over nine of them and beyond, into space! We were so spoilt by the quality of the entries that we wanted to show here some of the other superbly creative submissions that we received, in no particular order. 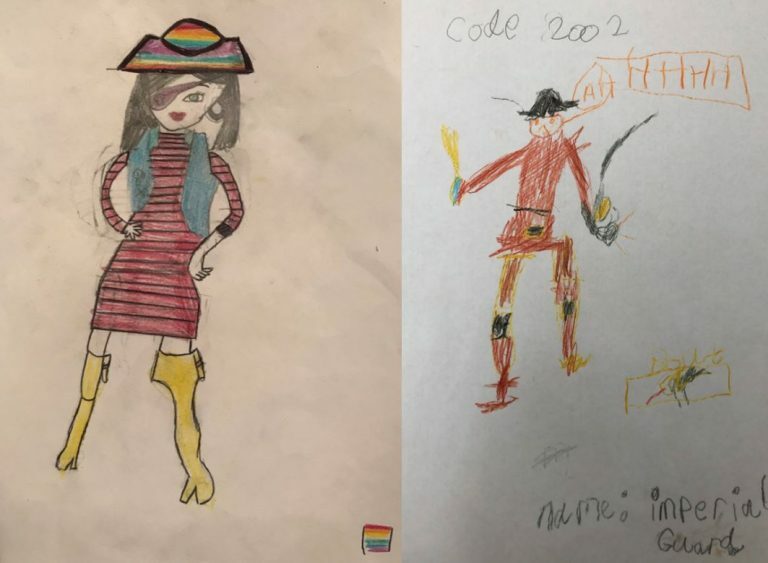 These entries below are from two of our youngest and eldest entrants, Maya (aged 3) and Georgia (aged 11). 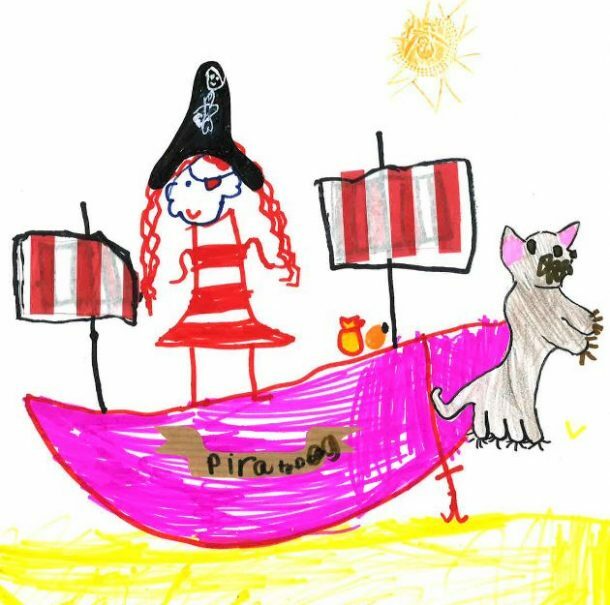 Maya’s creation MooMoo is a gentle pirate who blows kisses, but be warned, she will use her sword if attacked! 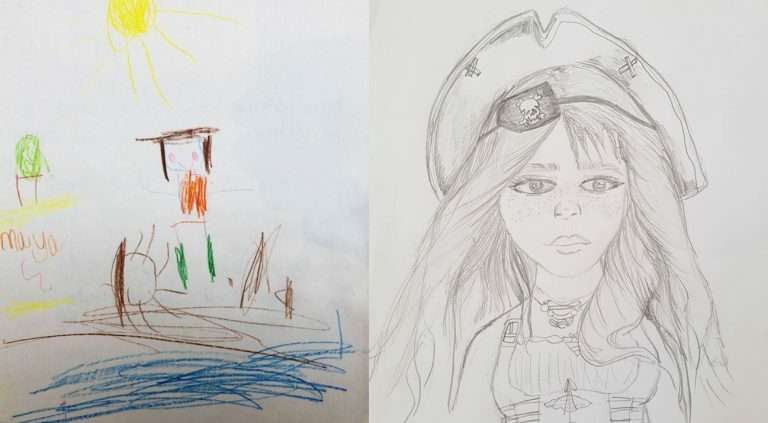 April was drawn by Georgia and is the most beautiful pirate to ever grace the seven seas. She was abandoned by her crew at an early age but overcame life’s obstacles to become the most skilled and powerful pirate princess there ever was. 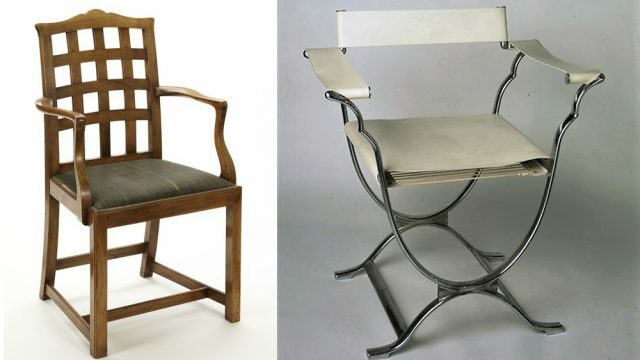 This next four drawings show the diverse influences on children’s creativity. 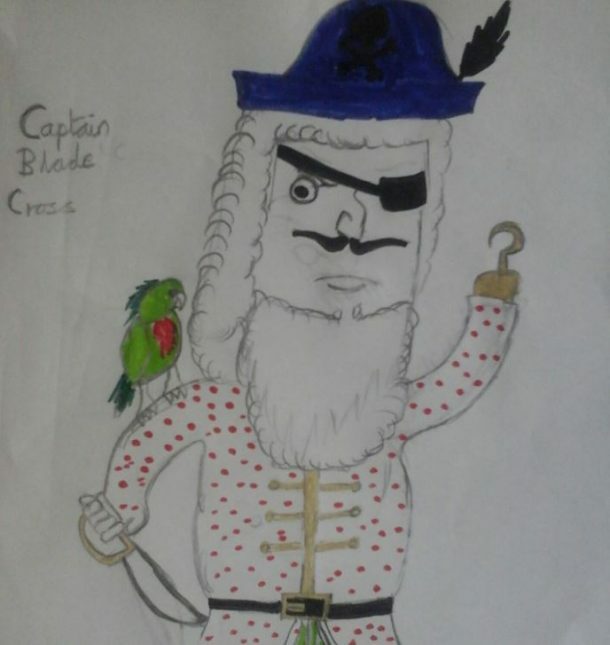 Artiom (aged 8) produced an amazing illustrated story about his pirate, John, which is somewhat reminiscent of illuminated manuscripts. In a particularly tense scene John had to sneak into the Rat Master’s base to steal some treasure – luckily he wasn’t caught. Spring (aged 9) used sport as an inspiration when conjuring Captain Football. Orphaned at a young age and born with a head bigger than his body, Captain Football hadn’t had much luck. Even when he joined a pirate crew his shipmates played football with his head! Luckily he eventually found a friend who treated him kindly and healed all his wounds from the kickabout. 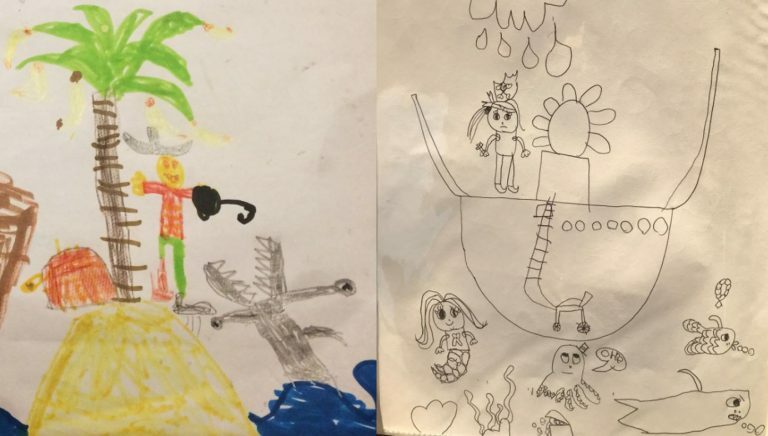 Sherlock (aged 6) and Esther (aged 5) both express a strong familiarity and love of a range of sea creatures, which populate their drawings. Sherlock’s pirate appears to be stuck on a desert island, fighting off a ferocious looking monster. Esther’s pirate, named Anne Enemy, is surrounded by all sorts of underwater creatures including an octopus with a top hat. In true pirate fashion, these final two illustrations depict diverse, global and inclusive pirate characters. Shahad’s unnamed pirate sports a rainbow flag hat that was particularly eye-catching amongst the entries. Along with thigh-high boots, a denim jacket and a purple eye patch, this pirate is dressed to impress! We had pirates come from across many seas, including one from Lithuania. Raif’s grumpy looking pirate, Imperial Guard, could be a scourge of the Baltic with his best friend, Black Beerd. We would like to extend our thanks to all entrants. Choosing even these ten was incredibly difficult and we are extremely grateful for the number and quality of the entries we had to choose from. Please come and see the winner and runner-up on display in the Grim Grog Tavern from today!